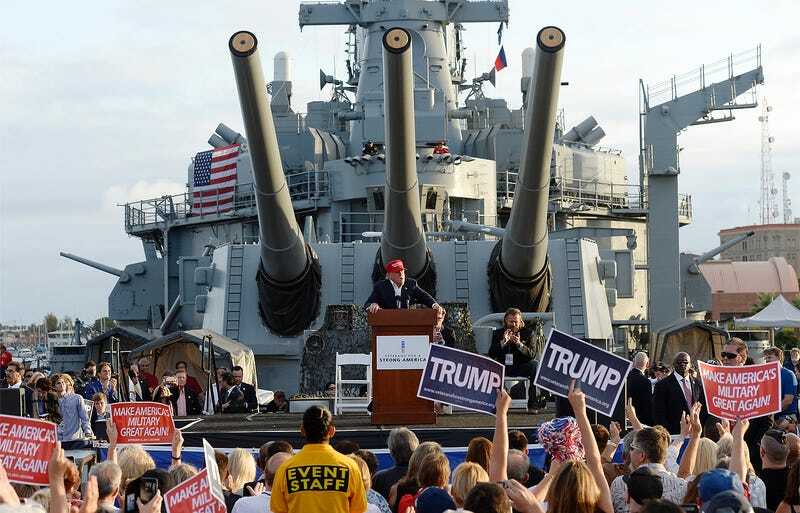 As usual, the cable news networks were waiting with baited breath last night for what was touted as a foreign policy speech, with details, by Donald Trump on the deck of the Battleship USS Iowa. Well, that didn’t happen. Instead we got the usual mix of talking points, although he did briefly mention that he wants to recommission the ship he was standing on. Would that even be feasible? It’s a question I get asked all the time actually. Could any of the Iowa Class Battleships be returned to service once again like Reagan did in the early 1980s? The fact of the matter is that there was, and still is to some degree, a meandering debate that has followed the Iowa Class’s last retirement, that being the need for naval gunfire support to support Marine beach landings and other amphibious operations. This is primarily why the Iowa Class Battleships were not made into museums or broken-up following their retirement in the early 1990s. Instead they were mothballed, a state the Iowa and the Wisconsin remained in until they were finally stricken from the Naval Register in the late mid 2000s. There have been various concepts over the last four decades that would see the Iowas turned into everything from jump-jet aircraft carriers to missile slinging arsenal ships with huge vertical launch cell farms, to rail-gun toting super-battleships. The removal of the ships many five-inch guns could make room for new capabilities and reduce the crew complement by at least a couple hundred sailors, which is a good thing considering these ships sailed with a crew of over 1,500 during the 1980s and early 1990s. Some have even pushed to have them take the place of our current two Blue Ridge Class command ships. Regardless of whichever concept would come to fruition, the cost to operate, upgrade and sustain these ships have always trumped (excuse the pun) their potential utility, at least in the 21st century U.S. Navy’s eyes. Yet in an age where seemingly anything with a microprocessor seems vulnerable to hacking, electronic and cycber attack, the Iowa Class represents the ultimate in analogue naval firepower. Additionally, their armor, which ranges between seven and 20 inches of steel depending on the area, could resist cruise missile attacks that would punch right through current destroyer and cruiser designs. With all this in mind, there are uses for these old ships, and as such there is a chance that the they could make a return to service. A very, very small chance. It would require industry to spin up production on parts that simply aren’t used anywhere anymore, although in a day of CNC machines and rapid prototyping technology, this hurdle may be a lower one than it once was. The knowledge-base of how to operate and maintain these old ships on the other hand is something that can’t be solved with leading-edge manufacturing techniques. It’s been close to 25 years since these ships last sailed in fighting condition, and with every day that passes the “brain-drain” of how to maintain and operate them increases. So the answer is yes, at least the Iowa and Wisconsin could be called back up to project American power around the globe once again, and the New Jersey and Missouri could act as a parts bin for them. Theoretically. They would require a total refit, including new command, control, communications, and self defenses, as well as totally revamped running and environmental systems. And all of that comes before adding new offensive capabilities. In all, it would be a challenging task that would cost many hundreds of millions, if not billions of dollars per ship, but it is technically possible. Just who knows if it would actually be politically possible. As for whether or not it’s a smart thing to do, that’s a huge question that remains.